You are currently browsing articles tagged Hot Springs. This last weekend was full of amazing coincidences. It started on Friday evening. Headed down to Nederland, Texas for services with Greg and Amanda Swafford, we stopped for a night with friends Brian and Jessica Fisher in Frisco, just north of Dallas. They had apologized earlier in the week for having to attend a minor league baseball game while we were there, but being the flexible, baseball loving missionaries that we are, we were up for the outing. 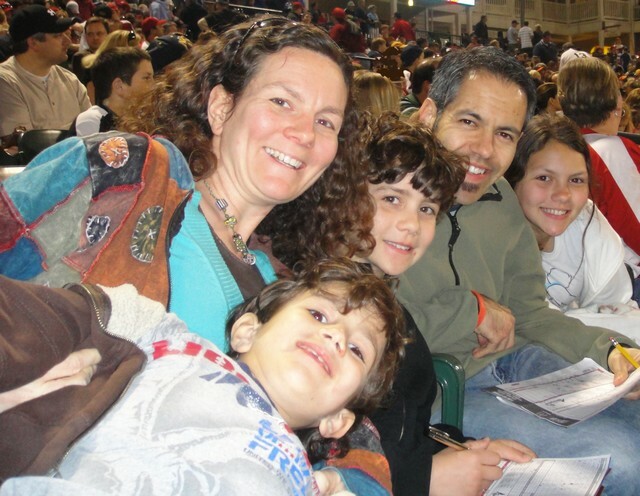 Imagine our surprise, however, when we found that the game was between the hometown Frisco Rough Riders and the visiting Springfield Cardinals! We got a chance to root for our hometown team in Texas! The real treat came following our weekend. Our nine hour trip back from services with Danny and Stephanie Baker in Leesville, Lousiana would take us past Hot Springs, Arkansas, the birthplace of the Assemblies of God. We debated the visit, as the side trip would certainly kill our ETA, but our debate ended as we researched the stop. The first General Council which gave rise to the Assemblies of God took place from April 2nd until the 12th, 1914. It just so happened that on Monday we were passing by Hot Springs on our denomination’s birthday! We called area churches and were directed to the spot which sits on Bath House Row in downtown Hot Springs. The plaque, laid on the 60th anniversary of the event, is the only physical remnant of the former Hot Springs Opera House where the council took place. It’s easily overlooked as visitors pass by, many without even looking down at the inscription affixed to the cement, but for us it has special significance. 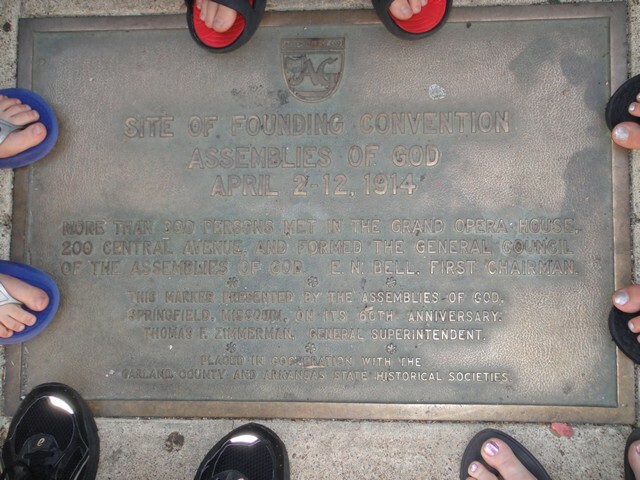 On Monday, April 12, 2010, 96 years after the event, we found ourselves returning to our roots, and as our feet surrounded the memorial plaque, we reflected on the principles that brought about the founding of the Assemblies of God–evangelism, missions, and ministerial training. We’re glad that now, almost 100 years after its organization, those principles are still at the forefront of its agenda. What’s even more humbling is that we’re able to serve as its representatives as we emphasize evangelism, missions, and ministerial training, making disciples in the Yucatán.